Local grocery store has Robin Hood and Gold Medal both for $2 each for a regular size (5 pounds) package. Wife said either is fine. What is the best out of the 2? I went with the Robin Hood, and the pizza I made with it turned out good. In this case, the brand of all purpose flour is less important than the fact that you are using all purpose flour rather than bread flour which is higher in protein or even bread machine flour which is even higher in protein. ^^ Yup, what Andy said. The brand doesn't really matter - it's the type. That being said, I usually go with Robin Hood myself. I love the logo, plus my mom used to buy it. On the front of that bag it says it is even good for bread machines. That is not always true. The makers of bread machines recommend that you use a special flour in order to get a better product. So don't be fooled by self-promoting ads. Jeff Hertzberg, who authored "Artisan Bread in Five Minutes a Day", mostly agrees with you, and says you can generally use what you like (for bread, anyway). 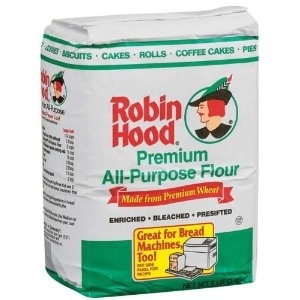 The exception: "Be aware that King Arthur All-Purpose Flour has a protein content of 12 to 13 percent, solidly in the range of high-protein bread flour rather than all-purpose." For pizza dough, you can find recipes calling for either. I use bread flour for pizza, mostly because I regularly make no-knead bread and always have a good supply of bread flour on hand.